This mockup shows how the Apple Store could look. Apple chooses some spectacular, historic locations for its Apple Stores — but those spaces don’t always want to be home to trendy retail stores selling expensive smartphones. While that description does, in fact, make clear why Apple would consider this an “appropriate” space for one of its stores, the move has nonetheless been heavily criticized. Of 1,800 responses to the city’s consultation on the project, virtually all — from conservationists to official bodies like the city’s official Beauty Council — answered negatively. What happens next is unclear. Sweden is already home to three other Apple Stores. 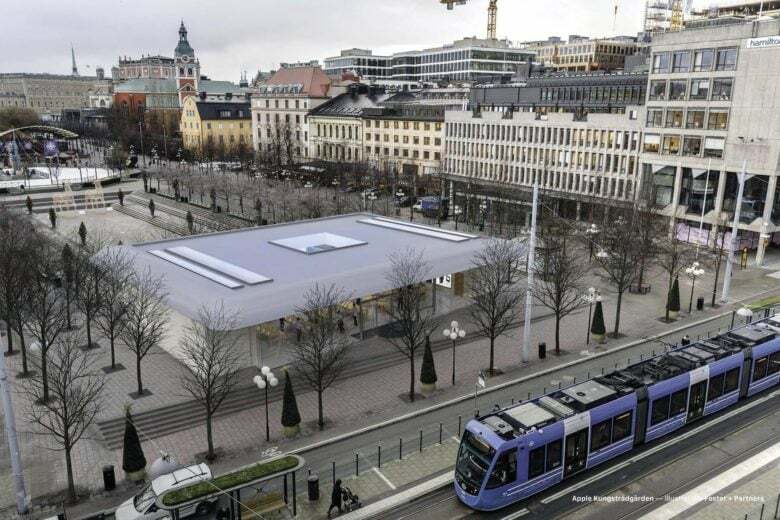 However, while that argument is open to criticism, so is the suggestion that Kungsträdgården is not a commercial space. In fact, the spot where the Apple Store would be located is currently home to a TGI Friday’s restaurant. The Apple Store would be larger, but it would also be considerably more attractive. This isn’t the first time that Apple’s retail ambitions have been thwarted by similar criticism. In Melbourne, Australia, a proposed Apple Store in Federation Square has run into related problems for causing a, “loss of definition to the square.” At present, it’s not clear whether the store will proceed.